The roadside wildflowers are rich and beautiful at the moment. I can’t resist trying to capture compositions as we zip by. Wow! 21st century Monet! Beautiful. I have so much fun with this type of photography! I’m thrilled you like it, Kathleen, thank you. ‘Colour Field’ would have been a good title – I’ll have to remember that! This is really beautiful. Very Monet, as someone else has said. Thank you, I’m happy you think so! It’s a fun and often surprising sort of exploration, isn’t it. you are the Old master. Subtle but firm ! The depth of air is incredible. 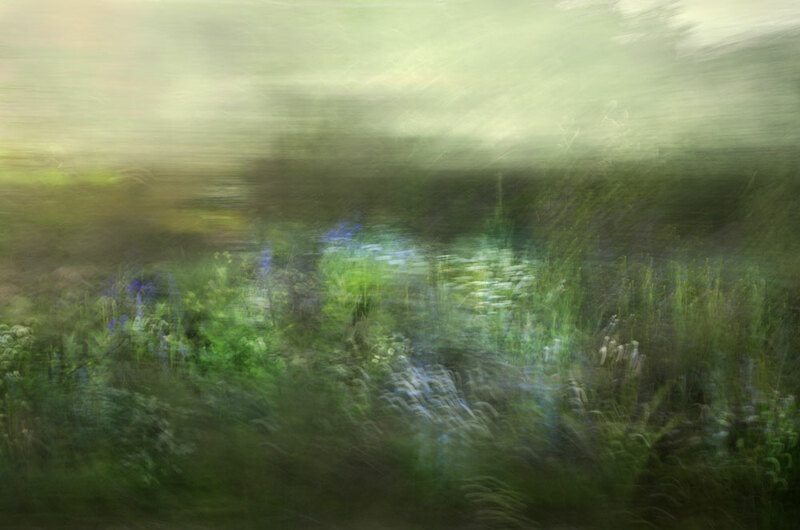 I am loving your soft focus floral landscapes, Yoshizen. Who can resist finding a way to photograph them? Thank you very much for your comment, I love this photographic process. Ah, perhaps a little Turner -like movement. I love his work, actually, so it’s a lovely comparison. Thank you, Louis. Thank you very much, Mark. I’m glad you think so. Beautiful! 😉 Love the softness. Thanks very much, I’m pleased you like it! Ha! : ) Thanks, Emilio. gorgeous abstract as always. lovely tones as well. Well I would rather say William Turner more dynamic than Monet ;P I think his mature style XD Impressive!!! Ah, well, Turner is a favorite of mine so I thank you for the comparison. : ) I’m so happy you like this, it’s part of a series I’m really enjoying working on. Amazing! Great use of layering, Karen. Beautiful! I love the color palette … it has a vintage feel. my god this is so lush and rich and beautiful. What a great capture Karen…you are Monet with a camera with this shot. Beautiful. Love the impression of movement among the flowers. Before I saw comments from two others, I was also thinking Turner – something in the light and detail. But really it’s yours, no one else’s. And I really like it! I’ve been enjoying the wildflowers as well, but this image immortalizes them-beautiful! beautiful, Karen, amazing colour ‘composition’ – great!! Gorgeous, Karen. I love those touches of intense color. So beautiful, Karen — reminds me of a Monet painting! Always happy to revisit your work. Absolutely painterly music here. I sigh. A Turner painting 🙂 Happy summer Karen. Beautiful.. Now 20 like this and a show! Thank you for the encouragement, Yves. There is a series happening but it might take a while to get to 20! J.M.W Turner meets Monet. I love it, Karen! A painting in nature as your energy of movement became part of the scene. Love it. The image looks like scrubbed and scraped oil paint. The light is gorgeously bleak and melancholy. I love it! I’m glad you like it, Richard, thank you! It’s such a fun process to try and make this sort of image work. I like the idea of photography referencing painting here. Beautiful as always. Has a watery feel that I like very much. Very nice. I’d be interested in hearing more about the the techniques and tweaks. This wants to be huge! I’d love to see a large white room with these all around me.. I would love to print this series huge and exhibit it. Your enthusiasm pushes me forward. Thank you, Cath! You “painted” a very good one, Karen. Such wonderful colour and movement Karen. Superb! breathtaking beauty…I really like these exquisite colors. I agree that the movement is Turneresque, but the coloration—ah, that’s yours alone. It’s just so very beautiful. This has the magic qualities of impressionism and it just draws me right into it. Then, I feel like I have to explore for hours the richness and the beauty. Just wonderful! Gorgeous, wd look amazing as a huge canvas!